Guest writers Derek Morris and Ken Cozens tell us about how their in-depth studies of East London have led to over ten years of research and four ground-breaking books. But when one looks for detailed studies of the eighteenth century urban areas east of the Tower of London little can be found. In fact most of the historical studies focus either on the City of London or parts of London to the west. This was the prime reason that Derek Morris, a well known East London historian and Ken Cozens, now an independent scholar of London’s maritime world, joined forces. They have continued to challenge previously accepted stereotypical views through the use of some of the not so well known primary sources, such as Land Tax records and their own very unique methods of researching . All this started some years ago after Derek discovered the Martin-Leake papers in the British Library. Analysis of the papers led him to make a major challenge to the established stereotypes which purport to describe London in the eighteenth century, and especially its eastern suburbs. Traditionally the eastern suburbs have been associated with “poverty, dirt, anarchy and crime”, but Stephen Martin-Leake’s papers and his account books suggested a different picture. To extend the research into Wapping, a river-side parish, Derek cooperated with Ken Cozens, an expert on London’s merchant networks in the 18th century. Their book Wapping 1600-1800 showed the diversity of interests and occupations in the area using previously unexploited primary sources. The book received critical acclaim and Professor Sarah Palmer of the University of Greenwich commented in the Preface to the book that “Morris and Cozens are to be congratulated on producing such a fascinating, informative and ground breaking study”. Morris used the land tax records to identify on a house-by-house, and street-by-street basis, the thousands of residents living in the riverside parishes on the north bank of the Thames from 1740 to 1800. This enabled Cozens to undertake further research into the Camden, Calvert and King’s merchant network. This group’s strong association with the supply of East India ships and transports for the Admiralty meant that leads from the India Office Records led to further primary sources being located at The National Archives. All this culminated in an in-depth article on Anthony Calvert of Camden, Calvert & King appearing in the Mariners Mirror. The next area tackled was Whitechapel, which in 1750 had a population of 25,000, double the size of Hull, and equal in size to Glasgow and Liverpool. 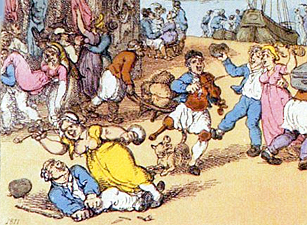 Whitechapel 1600-1800 was the first detailed study of its social history. Whitechapel was the home for millionaire timber merchants from Scandinavia and a thriving German community engaged in the sugar refining industry; James Fisher the Secretary of the Protestant Association who helped to organise the petition that led to the Gordon Riots in 1780; and Daniel Fenning, a grammarian and prolific text-book writer. Peter Guillery of the Survey of London comments on the book: “This book helps give Whitechapel a stronger historical identity after being neglected by many historians”. 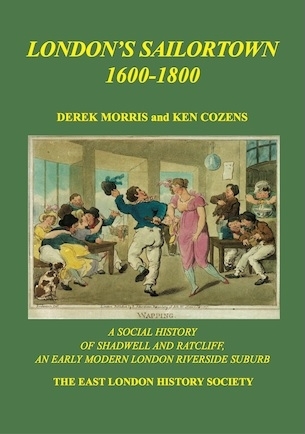 In 2014 Derek and Ken launched London’s Sailortown, 1600-1800 which explores the history of Shadwell and Ratcliff, two Thames-side areas that have seldom been studied. Well known London historian Professor Jerry White of Birkbeck College, University of London says in his Preface that “Revelatory is not too strong a term for the work undertaken here”. In the future Derek and Ken intend to continue to explore connections between London’s maritime communities and other UK Ports as well as further our knowledge of the international trade dimension of some individuals and groups by co-operating with the Ports and Urban Culture Project. Derek Morris, Mile End Old Town, 1740 1780; a Social History of an Early Modern London Suburb (London: East London History Society, 2007). Derek Morris and Ken Cozens, Wapping 1600-1800, A social history of an Early Modern London Maritime Suburb (London: East London History Society, 2009). Derek Morris, Whitechapel 1600-1800: A social history of an early modern London Inner Suburb (London: East London History Society, 2011). Derek Morris and Ken Cozens, London’s Sailortown, 1600 – 1800. A Social History of Shadwell and Ratcliff an Early Modern London Riverside Suburb, (London: East London History Society, 2014). D. Morris and K. Cozens, “The Shadwell Waterfront in the Eighteenth Century,” Mariner’s Mirror, vol. 99, no. 1, (2013), 89-94. Gary L. Sturgess and Ken Cozens, “Managing a Global Enterprise in the Eighteenth Century: Anthony Calvert of The Crescent, London, 1777-1808,” Mariner’s Mirror, vol. 99, no. 2, (2013), 171 – 195. British Library, Add Ms 47989, vol. 4, Leake Papers. Dictionary of National Biography, Stephen Martin-Leake. Tower Hamlets Local History Library, Ms 474, Stephen Martin-Leake Account Books. “How Derek Morris and Kenneth Cozens are rewriting the maritime history of East London North of the Thames: a review,” Northern Mariner / Le Marin du Nord, vol. 23, no. 3/4, (2014), 413. Dr Brad Beaven is a Reader in Social and Cultural History and has worked at the University of Portsmouth since 1994. He has published widely on urban popular culture in Britain in the nineteenth and early twentieth centuries. Find out more about Brad.